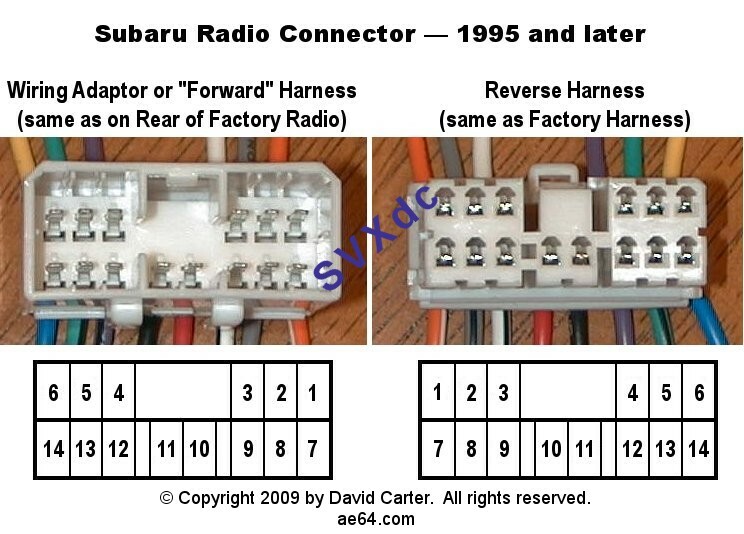 The table below was compiled from all of the Subaru radio wiring diagrams from 1993-2009. 2009 continues to use this same pin-out. Cars without the harman/kardon premium audio use the same factory colors as 2008. A few of the factory speaker wire colors changed on cars with the h/k system. 2010 radios have changed to a new 20-pin connector. See this pin-out. In North America, Legacy models from 1993-1994 continued to use the pre-1993 radio connectors (two smaller plugs). Outside North America, 1993-1994 Legacies switched to the new, single 14-pin plug. If your car has the 14-pin plug, the pin-out will be the same as listed here. Unfortunately, I do not have the car's factory wire color information for those years. wires go to car's Speakers, etc. 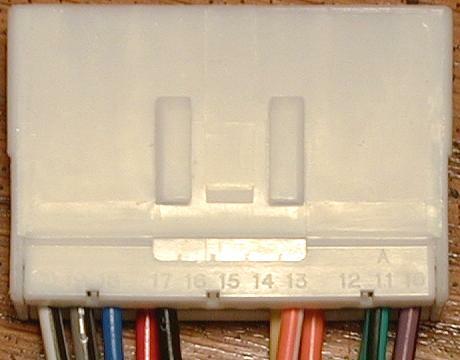 The pin numbers may be stamped on the sides of the connectors, on the hinged flaps at the rear that lock in the wires. The numbers are very hard to read until you hold the connector at just the right angle in the light. When two colors are listed, the first is the main color and the second is the stripe color (main/stripe). "NC" means there is no metal contact at that position in the connector shell (and thus no wire). Column "A" lists the wires on the Radio Connector in the car. This is the plug whose wires disappear behind the dash and go to the speakers, etc. e. Column "B" lists the wires on Reverse and Forward Harnesses. These are the EIA standard wire colors, used by after-market receiver and wiring harness manufacturers. Use this column to verify that the harness was assembled correctly. In the Legacy / Outback / Baja: If restoring a damaged or missing radio connector, crimp or solder a reverse harness' wires in column B to the corresponding wires in column A. If installing a subwoofer or Line Output Converter (LOC), crimp or solder a reverse harness to the same colors on a 'forward' harness (wires in column B for both). f. If you're working with the Legacy / Outback / Baja wires (column A), note that there are complimentary pairs (e.g., a White/Red and a Red/White). Don't get these mixed up! The stripe color is thinner than the main color. There are also duplicated colors in some model years (e.g., Green). It helps to work in bright light. Note: Although these harnesses are referred to as "WRX" they have exactly the same pin-out as the Legacy, Outback, and Baja. © Copyright 2005-2010 by David Carter. All rights reserved.